The playlist for the December 27, 2017 broadcast of the Swing Shift Shuffle New Year's Eve Special has now been added to the playlist filing cabinet. While it is admittedly belated, I would like to wish everyone a very Merry Christmas! After all, remember there are 12 days of Christmas, so you have another 9 days to go! On this Friday before Christmas, I wanted to again post one of my favorite holiday cartoons. Although some of the imagery in this film seems a bit dark for a holiday cartoon, the message is always relevant. This short was released in 1939, when Europe was either on the brink of or already at war, many in the U.S. were not interested in reliving the horrors of World War I, and the Japanese had not yet attacked Pearl Harbor. 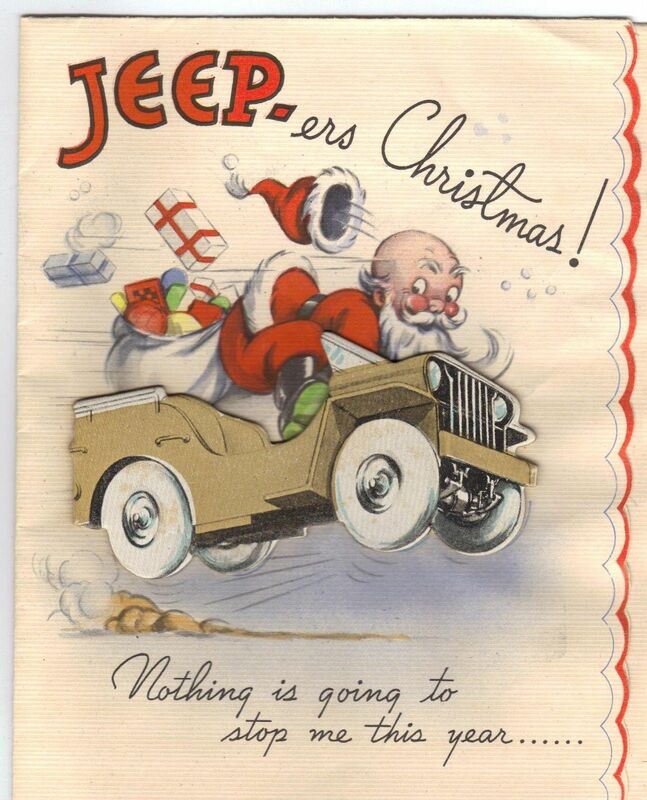 From the Internet Archive, here is Peace On Earth. I'll be taking a break for a week, but I'll back in the new year. This morning's Sunrise Serenade was "Christmas In Killarney" by Bing Crosby. Enjoy the video from YouTube. Today's Sunrise Serenade was "Swingin' Them Jingle Bells" by Fats Waller and His Rhythm. Click on the song title to listen courtesy of Jazz On Line. The playlist for the December 20, 2017 broadcast of the Swing Shift Shuffle Christmas Special has now been added to the playlist filing cabinet. Join me tonight for the Swing Shift Shuffle Christmas Special, featuring the best Swing, Big Band and popular holiday songs from the 1930's-40's. Tune in to 89.9 FM in the Memphis area, or online at WEVL. This morning's Sunrise Serenade was "Christmas Island" by the Andrews Sisters. Click on the song title to listen courtesy of Jazz On Line. When Wells appeared, Torme asked him about the little poem. It was so hot, Wells said "I thought I’d write something to cool myself off. All I could think of was Christmas and cold weather." Torme said "This might make a song." A year later, Nat King Cole recorded "The Christmas Song," and the rest is musical history. Today's Sunrise Serenade was "Santa Claus Is Coming To Town" by Tommy Dorsey and His Orchestra. Click on the song title to listen courtesy of Jazz On Line. 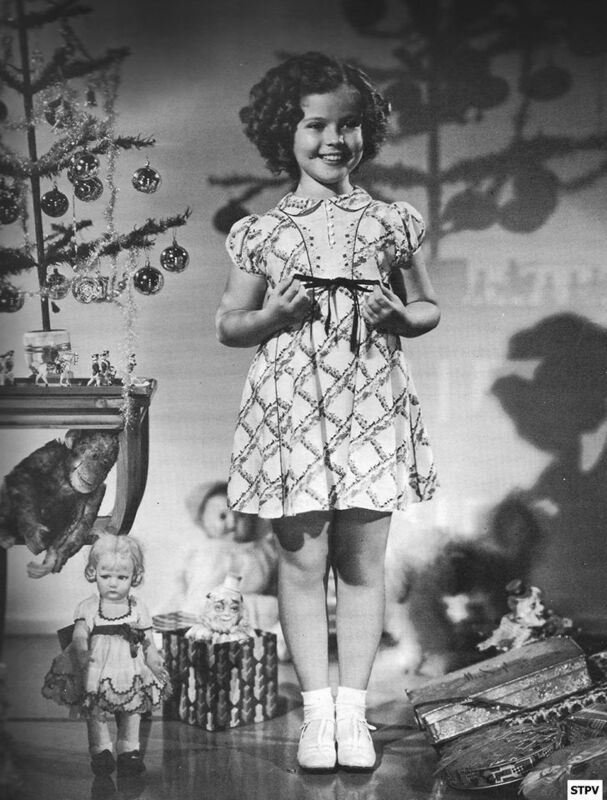 Vintage Everyday posted this list of the top Christmas gifts sold by Macy's in 1948. 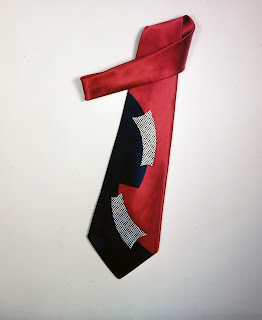 Lots of apparel on the list, including shirts, ties, nylons; as well as items like pearl necklaces, whisky and music. More than 15 years before Rankin Bass screened their animated version of Rudolph the Red-Nosed Reindeer on television, Jam Handy released this animated short of the same story directed by Max Fleischer. From the Internet Archive, here is Rudolph The Red-Nosed Reindeer. This morning's Sunrise Serenade was "Jingle Bells" by Bing Crosby and the Andrews Sisters. Enjoy the video from YouTube. In 1937, Sir Malcolm Campbell set a new world water speed record of 129.50 mph in his Bluebird K3 hydroplane, and the following year, he broke the 130 mph mark at 130.91 mph with the same boat. Hemmings Motor News reported that now, 80 years after the vessel's last record, it has returned to the water. 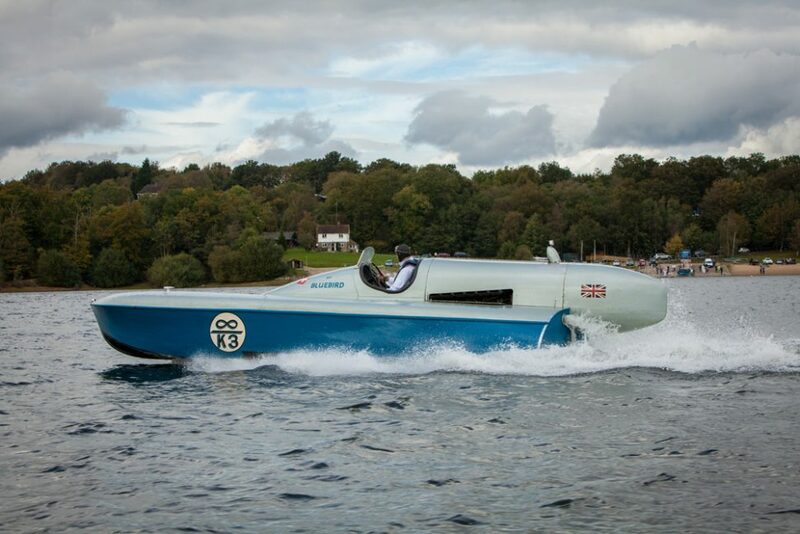 After a 20-year-long restoration by current owner Karl Foulkes-Halbard, the Bluebird K3 managed a speed of 52 mph in a test on Bewl Water in Kent, U.K., in early September in Kent, U.K.
Today's Sunrise Serenade was "Let It Snow, Let It Snow, Let It Snow" by Woody Herman and His Orchestra. Enjoy the video below from YouTube. The playlist for the December 13, 2017 broadcast of the Swing Shift Shuffle has now been added to the playlist filing cabinet. This morning's Sunrise Serenade was "Dese Bones Gonna Rise Again" by the Golden Gate Quartet. Enjoy the video from YouTube. Dull Tool Dim Bulb posted this series of four drawings with watercolor from around 1940. 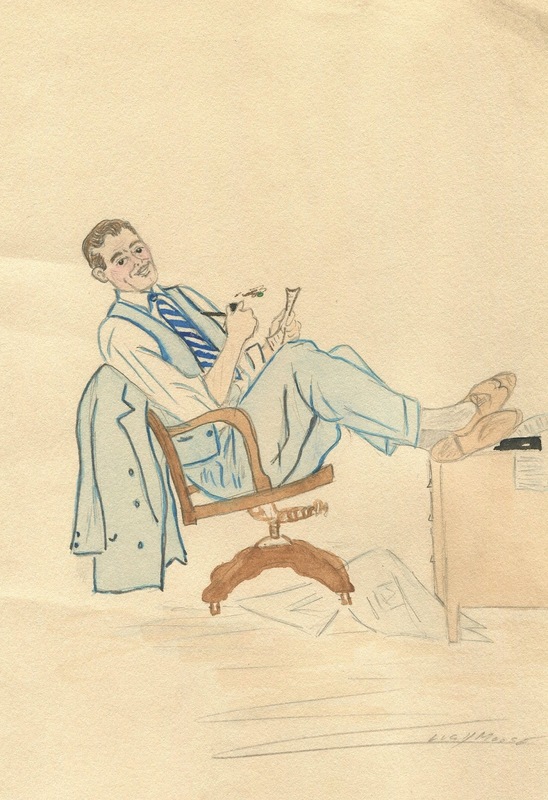 The artist was a Ms. Lucy Moose, and these portraits show men in various poses. Aside from being well dressed by today's standards (such attire would have been common for many men back then), all these gentlemen appear to be pretty relaxed. Not a lot of action here. These guys are just hanging out. Here is another find from the Nashville Flea Market in October. 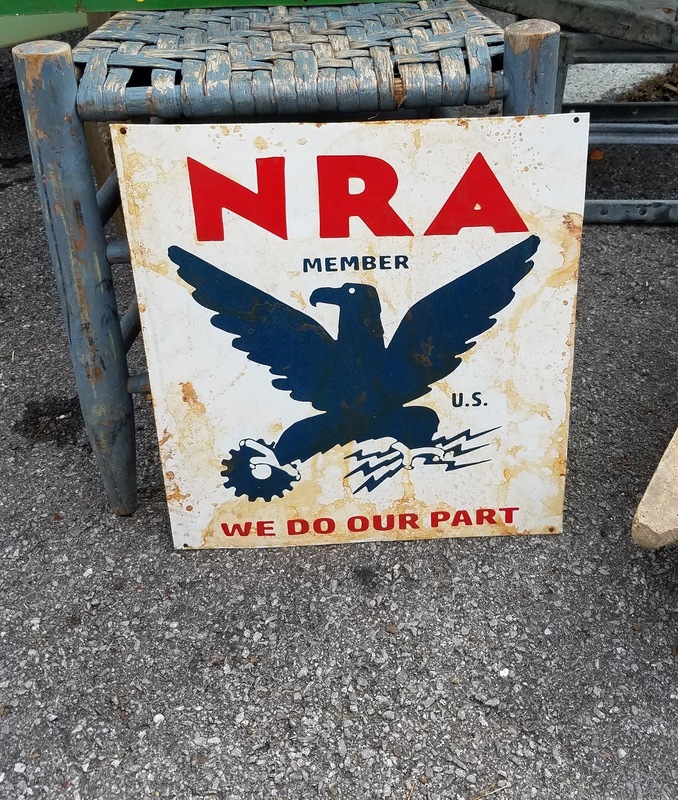 Straight from the New Deal, this is a metal National Recovery Administration (NRA) sign. The NRA (no, not the National Rifle Association) was a federal agency created during the New Deal to help the country recover from the Great Depression, and businesses would hang these signs to show that they were participating in NRA programs. It appeared to be original, and I have not found any reproductions available. The asking price was $75. Interestingly, I found another such sign in similar condition at another booth for $80. I had not seen even one, much less two, of these signs prior to this occasion. This morning's Sunrise Serenade was "When It's Christmas On The Range" by Bob Wills and His Texas Playboys. Click on the song title to listen courtesy of Jazz On Line. 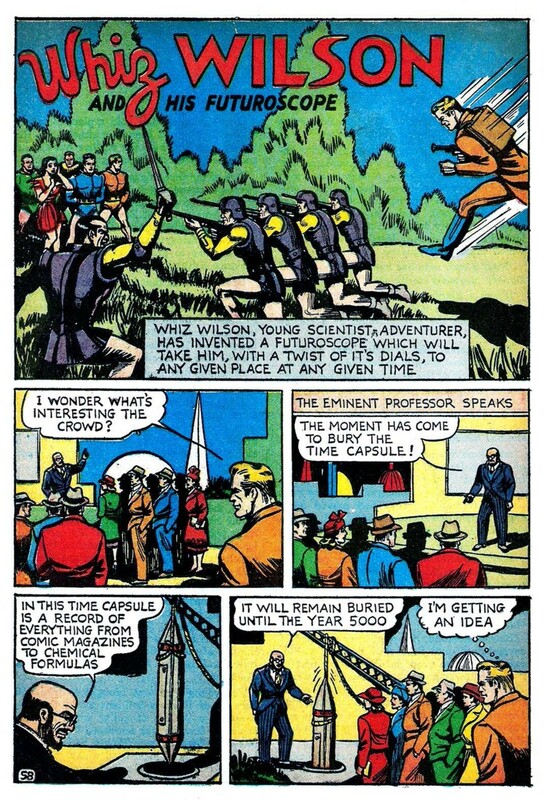 As a time traveler, "Whiz" Wilson has a unique approach. He does not just handle whatever problem he finds in the present time with the tools available, nor does he jump back in time to prevent the problem from arising. Instead, he jumps to the future, borrows advanced weaponry, and returns to defeat his foes with technological superiority. 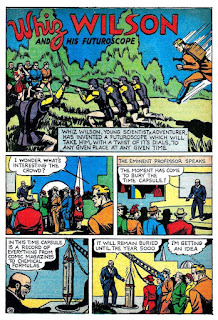 Pappy's Golden Age Comic Blogzine posted this story from 1941. Today's Sunrise Serenade was "Stick To Your Knittn', Kitten" by the Four Vagabonds. Enjoy the video from YouTube. The playlist for the December 6, 2017 broadcast of the Swing Shift Shuffle has now been added to the playlist filing cabinet. This morning's Sunrise Serenade was "Swinging On A Star" by Bing Crosby. Click on the song title to listen courtesy of Jazz On Line. 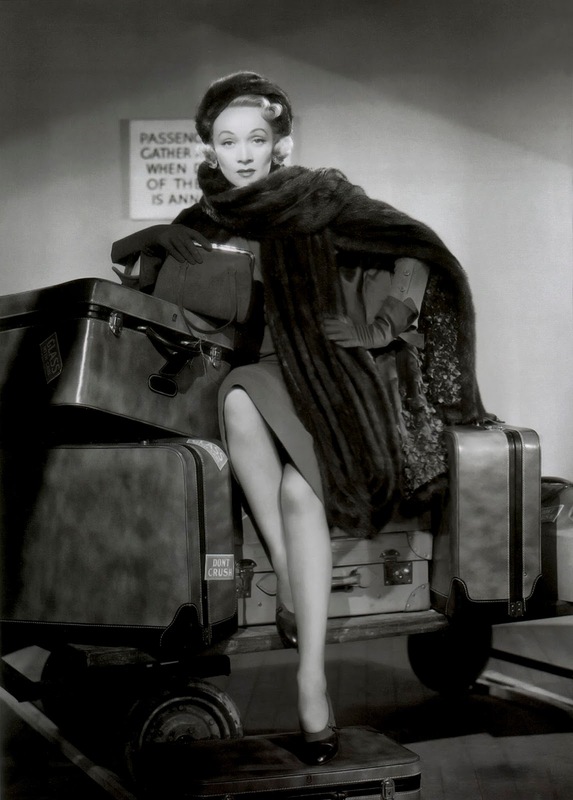 Here is a set of publicity photos of Marlene Dietrich, posted on Vintage Everyday, taken during the filming of No Highway In The Sky in 1948. One of my favorite films, in addition to Ms. Dietrich it starred James Stewart, Jack Hawkins and Glynis Johns. Ms. Dietrich played a glamorous movie star (typecasting?) who becomes intrigued by a sincere but eccentric aviation engineer played by Stewart, who believes the aircraft in which they travel will crash at a specific time. Today's Sunrise Serenade was "I Want The Waiter (With The Water)" by Ella Fitzgerald. Click on the song title to listen courtesy of Jazz On Line. 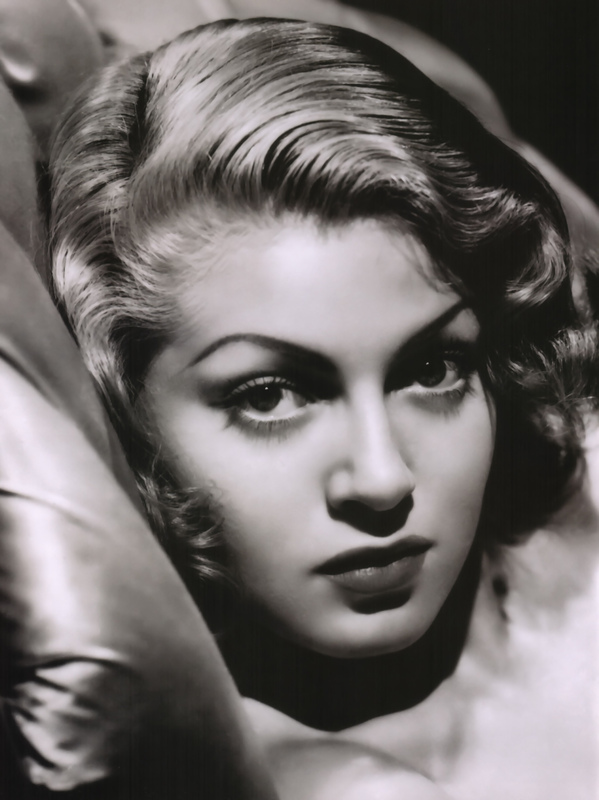 The Star of the Month on TCM for December is Lana Turner, with her movies playing every Tuesday. 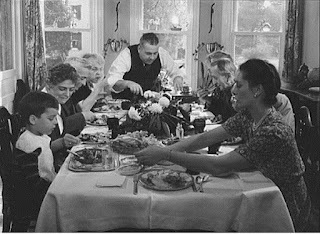 With the holidays upon us, there are plenty of chances for seasonal cheer with some favorite films, and I noticed a series of World War II films on Friday, December 8, including Casablanca and This Land Is Mine. Full schedule here. This morning's Sunrise Serenade was "This Time It's Love" by Cab Calloway and His Orchestra. Click on the song title to listen courtesy of Jazz On Line. The playlist for the November 29, 2017 broadcast of the Swing Shift Shuffle has now been added to the playlist filing cabinet. 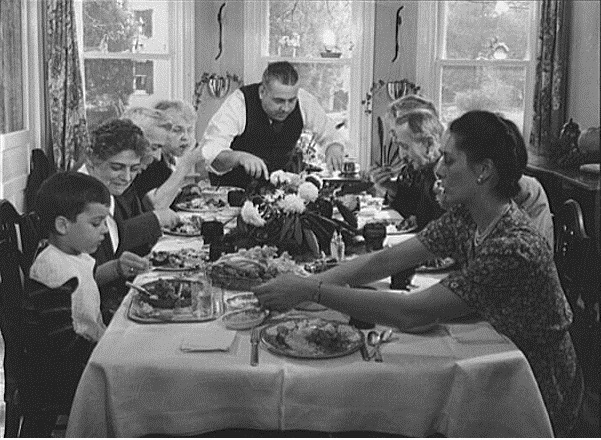 We here at the SSS wish you all a very happy, healthy and safe Thanksgiving! I'll be taking my annual leave for a week or so, but I'll be back in December. The playlist for the November 22, 2017 broadcast of the Swing Shift Shuffle has now been added to the playlist filing cabinet. Sunrise Serenade: Oh Johnny, Oh Johnny, Oh! This morning's Sunrise Serenade was "Oh Johnny, Oh Johnny, Oh!" by the Andrews Sisters. Click on the song title to listen courtesy of Jazz On Line. I'm adding a new series to the blog: Finds. Occasionally, I get the chance to hit the odd antique store, estate sale or flea market. Whether I buy anything or not, I often see some pretty interesting items from the Swing Era, and I often learn something new when I do. Case in point: this 1940 RCA Victrola Wireless Record Player I found last month at the Nashville Flea Market. 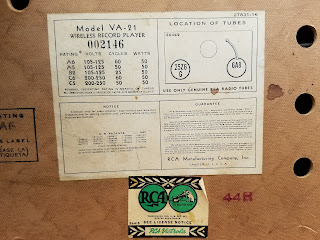 Yes, you read that correctly - "Wireless" record player. 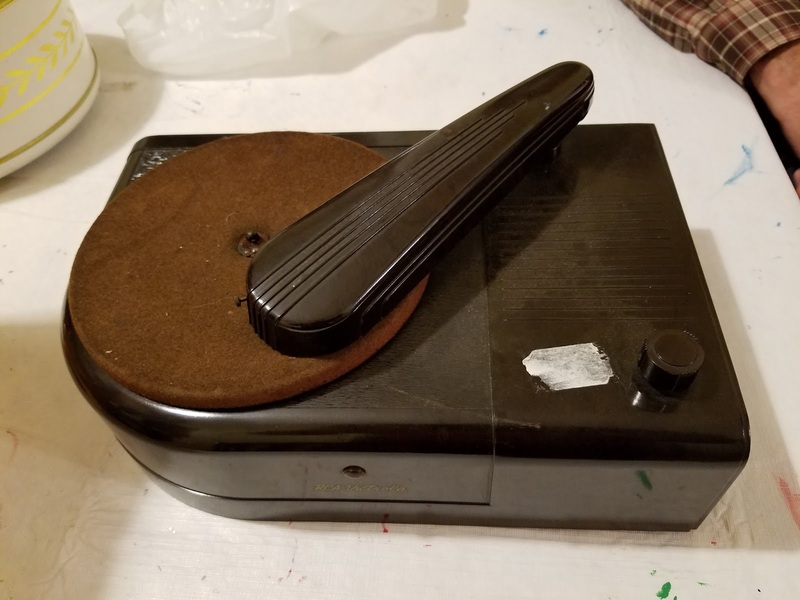 This unit has no speakers, and other than a power cord, no cables or cords to connect it to any other device. How do you hear the music? 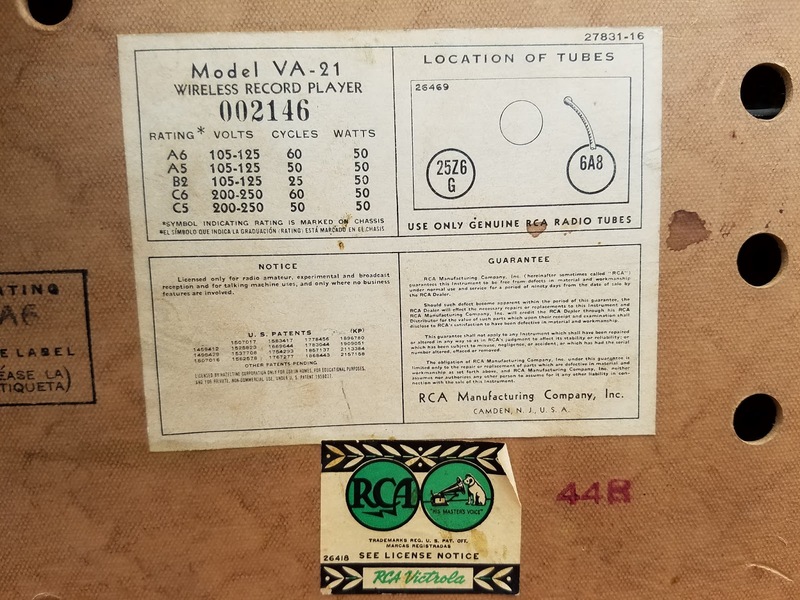 This device sends the audio from the record, via its own internal radio transmitter, to any nearby AM radio tuned to that frequency. Yes, well before Bluetooth and Mr. Microphone, folks could hear their music transmitted wirelessly from one device to another. Prior to finding this item, I had no clue that such things existed. Apparently they were manufactured by several companies from 1939 to 1942. P.S. 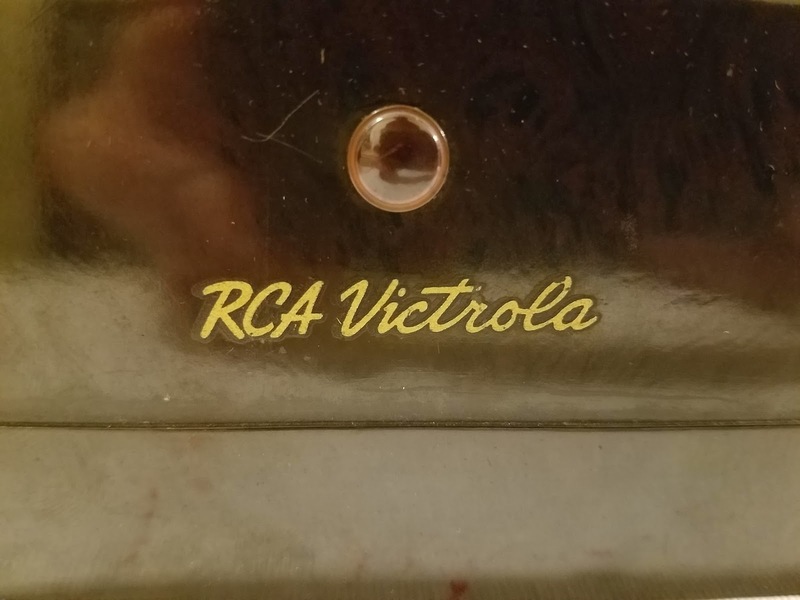 - If you're wondering what happened to it, I bought it on behalf of a friend of mine who restores antique radios. Of course, he knew exactly what it was, and it has found a good home. Today's Sunrise Serenade was "Let That Be A Lesson To You" by Benny Goodman and His Orchestra from the 1937 film Hollywood Hotel. Enjoy the video from YouTube. This morning's Sunrise Serenade was "And Her Tears Flowed Like Wine" by Stan Kenton and His Orchestra with Anita O'Day on vocal. Click on the song title to listen courtesy of Jazz On Line. Toady's Sunrise Serenade was "Ta-hu-wa-hu-wai" by the Merry Macs. Click on the song title to listen courtesy of Jazz On Line. The playlist for the November 15, 2017 broadcast of the Swing Shift Shuffle - Fall Pledge Drive Special: "Recurring Themes" - has now been added to the playlist filing cabinet. Tune into the Swing Shift Shuffle tonight for our WEVL Fall Pledge Drive Special entitled "Recurring Themes." In modern popular music, it would be very unusual for one top recording artist to release a song, and then have another top artist release the same song within a relatively short period of time. Such an occurrence was not unusual in the 1930s-1940s, however, as many different artists would record the same song, usually with different arrangements, and sometimes even writing lyrics to transform an instrumental hit into a vocal. Tonight, I'll be playing popular songs from the Swing Era recorded by various artists in different styles, often not the performers most associated with the song today. Tune in, swing out and make a pledge to WEVL for our Fall Pledge Drive. As an appetizer, here is Artie Shaw and His Orchestra performing "In The Mood," a song primarily associated with Glenn Miller. This morning's Sunrise Serenade was "Saint Louis Blues March" by Glenn Miller and His Orchestra. Enjoy the video from YouTube. Today's Sunrise Serenade was "Pennsylvania 6-5000" by Glenn Miller and His Orchestra. Click on the song title to listen courtesy of Jazz On Line. This morning's Sunrise Serenade was "Till Then" by the Mills Brothers. Click on the song title to listen courtesy of Jazz On Line. Today's Sunrise Serenade was "Pell Mell" by Les Brown and His Orchestra. Nothing says "swing" like a bass clarinet! Enjoy the video from YouTube. The playlist for the November 8, 2017 broadcast of the Swing Shift Shuffle has now been added to the playlist filing cabinet. Well, the poster says it all, which is what a poster should do. Don't miss the Rhodes College Swing Dance Night, next Thursday, November 16 at 7:30 p.m. in the McCallum Ballroom of the Bryan Campus Life Center. Free lessons with the Red Hot Lindy Hop at 7:00 p.m.
Today's Sunrise Serenade was "Victory Polka" by the Andrews Sisters. Enjoy the video from YouTube. 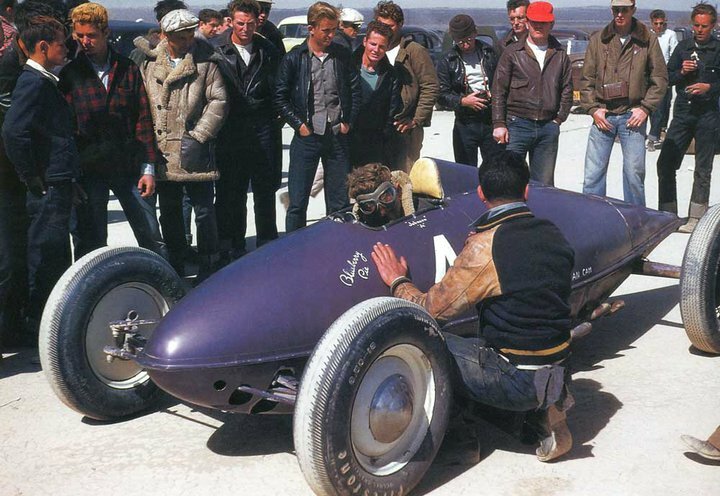 Posted on Rivet Head, this Kodachrome photo gives us a nice color look at some Bonneville Salt Flats racers in the late 1940s. The featured racer is a classic "belly tank" car, made from a war surplus auxiliary aircraft fuel tank. This morning's Sunrise Serenade was "Lazy River" by the Mills Brothers. Click on the song title to listen courtesy of Jazz On Line. This cartoon is another variation on a standard theme from the era. The family pet is on its last chance. Any more noise, messes, trouble, etc., and out it goes. Then a cute little animal, or trio of animals in this case, show up to cause havoc. The family pet struggles to protect the newcomer, while taking the blame for its damage. Warner Bros did it. MGM did it. Here, from the Internet Archive, is Famous Studios' version: Hector's Hectic Life. Today's Sunrise Serenade was "Death Ray Boogie" by Pete Johnson. Enjoy the video from YouTube. Today's Sunrise Serenade was "Sweet Georgia Brown" by Johnny Mercer. Enjoy the video from YouTube. The last Red Hot Lindy Hop lesson and session at the Rumba Room in 2017 will be this Friday, November 3. Free beginner lesson at 7:00 p.m. Free admission before 7:00 p.m. and $5 thereafter. Beginning in 2018, the regular RHLH dances will be monthly rather than weekly. Find out more here. This morning's Sunrise Serenade was "Don't Sit Under The Apple Tree" by the Andrews Sisters. Click on the song title to listen courtesy of Jazz On Line. 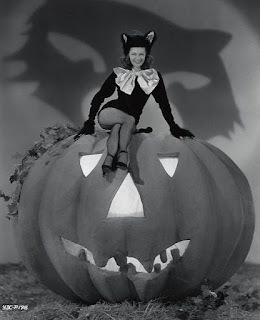 Happy Halloween from Yvonne DeCarlo, courtesy of Film Noir Photos. Considering that one of Ms. DeCarlo's most famous roles later in life was Lily Munster in The Munsters, this image from earlier in her career seemed even more appropriate for Halloween. Today's Sunrise Serenade was "New East St. Louis Toodle-Oo" by Duke Ellington and His Orchestra. Click on the song title to listen courtesy of Jazz On Line. This morning's Sunrise Serenade was "It's A Sin To Tell A Lie" by Fats Waller and His Rhythm. Click on the song title to listen courtesy of Jazz On Line. Streamline recently reviewed the 1939 version of Raffles, the story of an upper class cricket player, A.J. Raffles, whose nighttime persona is "The Amateur Cracksman," a brilliant jewel thief. In the title role, David Niven manages to play cricket, hit all the high society parties, steal jewels, elude the police and give away the loot to those who need help. The 1930 version of the same film starred Ronald Coleman in the same role. I have seen both films, and both are enjoyable. Today's Sunrise Serenade was "Yes Indeed" by Tommy Dorsey and His Orchestra with Jo Stafford and Sy Oliver on vocals. Click on the song title to listen courtesy of Jazz On Line. The playlist for the October 25, 2017 broadcast of the Swing Shift Shuffle has now been added to the playlist filing cabinet. Well, this is what I get for not paying attention. I just found out that the 2017 Jimmie Lunceford Jamboree Festival is going on right now through October 29. There are events going on every night this week, including art shows, lectures, jam sessions and movies all over town celebrating one of the biggest musical talents to come out of Memphis. Check out the site and see if you can join in the fun. This morning's Sunrise Serenade was "Anvil Chorus" by Glenn Miller and His Orchestra. Click on the song title to listen courtesy of Jazz On Line. The Red Hot Lindy Hop lessons and sessions continue with live music by Will Lang at the Rumba Room this Friday night. Free beginner lesson at 7:00 p.m. Free admission before 7:00 p.m. and $5 thereafter.